The NHL playoffs are now in progress, as the best teams in professional hockey compete to determine the champion and winner of the Stanley Cup. Game Changer MVP is proud to partner with several NHL playoff teams, including the Tampa Bay Lightning. 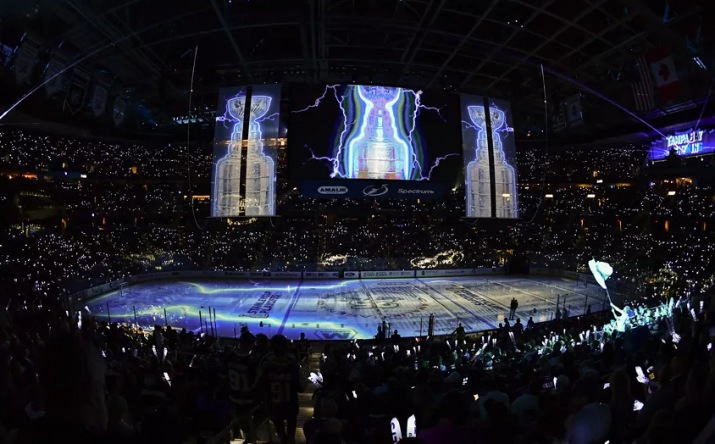 This season represents the fourth year our company has supported the Lightning with branded custom graphics, ice projections and interactive gaming. Our dynamic opening ice projections set the tone for each home playoff game, rallying fans to a fever pitch. The Lightning also make great use of FLASHPOINT, the new interactive app from Game Changer MVP. Using the video display and flashlight on smartphones, FLASHPOINT connects fans to a unique and fun engagement experience. We’re proud to introduce Game Changer MVP’s new 3D animated emoji filters. Our 2D emoji library has become a fan favorite in stadiums, rinks and arenas across the country. The new 3D designs add more depth and expression to this innovative technology. If you currently use our standard 2D emoji package, how about an upgrade? You’ll love how these fun 3D animations come to life in your venue, adding personality, energy and pizzazz to their fan appeal. Spring football renews hope in the hearts of loyal college football fans that this could be THE YEAR. The annual spring scrimmage at college campuses across the country continues to grow in popularity and attendance. At the University of Georgia spring game on April 21st, fans were treated to a new live interactive experience designed and supported by Game Changer MVP. Using new technology with non facial recognition, images of Bulldog fans were transformed into members of Georgia’s legendary tough defense…complete with branded 3D shoulder pads.